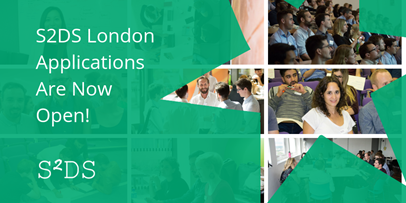 Applications for in-person S2DS London programmes (open to final year PhDs and PhD graduates) are now open and close 2nd April 2019. Your blend of programming, mathematics, statistics, and curiosity are an excellent foundation for a career in data science, and your ability to communicate complex concepts to technical and non-technical audiences alike is a powerful skill. The missing piece of the puzzle is commercial experience, and this is where Pivigo’s Science to Data Science (S2DS) programme can help. Take a look at the reviews S2DS has received from its graduates at coursereport and switchup. If you would like more information, please visit www.s2ds.org. A flyer with further details is attached. If you have any questions, please don’t hesitate to get in touch at deepak.mahtani@pivigo.com.